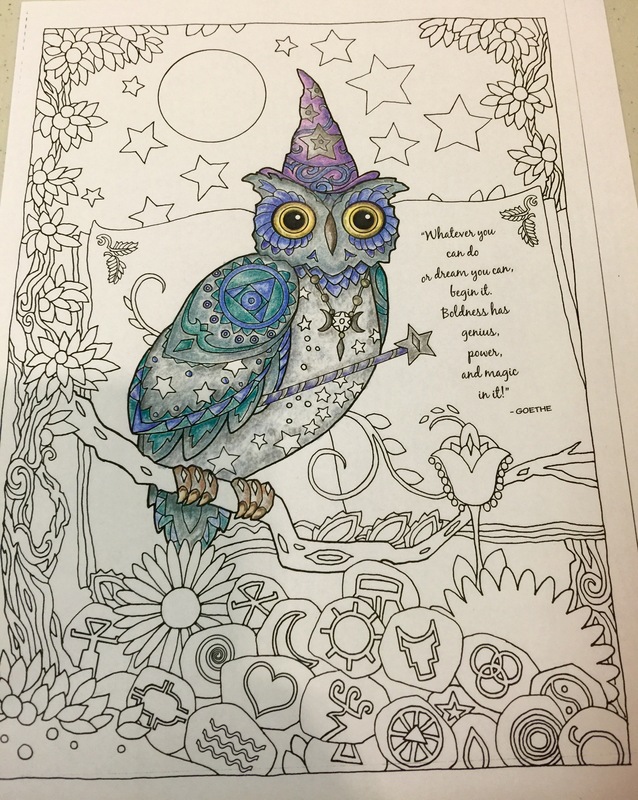 I’ve shared recently about my renewed interest in coloring. The market is flooded with coloring books for adults as this craze sweeps around the world. I’m delighted! I love coloring and the new coloring books provide beautifully detailed drawings that allow my creative side free reign. 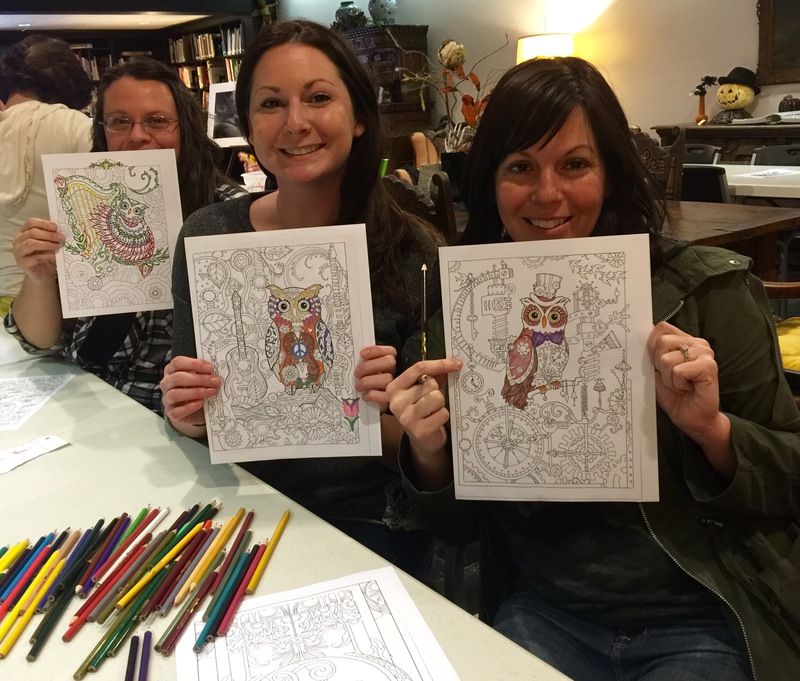 This event in Joplin was perfect today for all us coloring enthusiasts…the inaugural meeting of the Coloring Book Club. 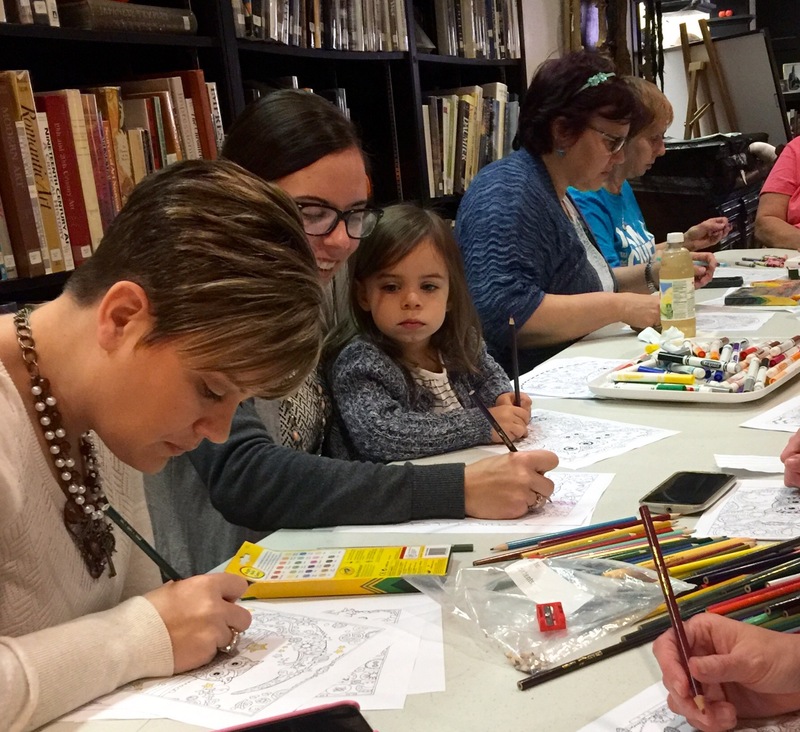 Sponsored jointly by Spiva Center for the Arts, Post Art Library, Connect2Culture and Cottage Small Coffee Roasters, the first coloring meet up was held at the Post Art Library, within the Joplin Public Library. 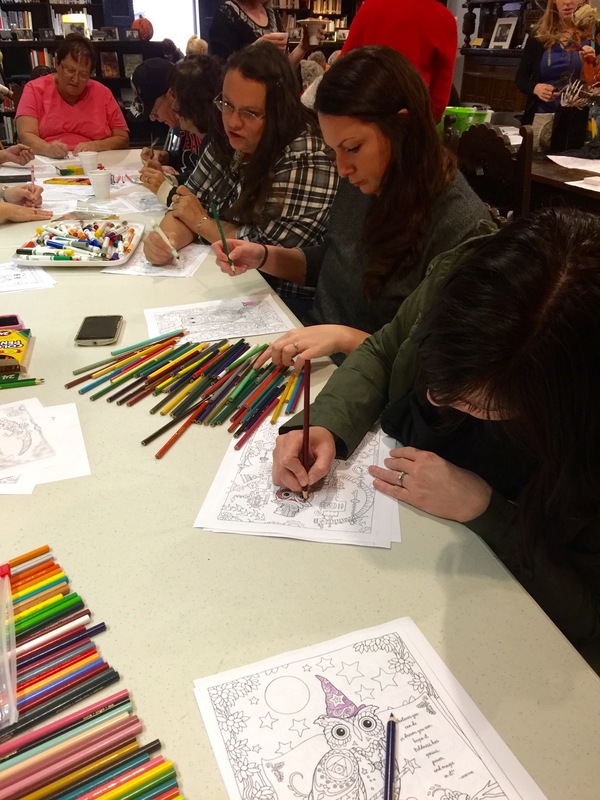 Refreshments were provided along with coloring pages and markers, crayons and pencils. Approximately 60 people attended today. I was excited to be one of the attendees! My daughters Elissa and Adriel joined me, along with Elissa’s friends Aimee, Susan, and Lacey. They are my friends now too! Lacey’s little daughter Vivian attended with her mom. We had such fun, at our end of the table, chatting as we colored. Elissa, Aimee and I all brought our own sets of colored pencils and I packed a pencil sharpener too, which proved to be a good thing. We sharpened our pencils into a plastic baggie to keep the library tidy. We looked through coloring pages that were provided and all of us selected owl pictures, each of us ending up with a different page. Elissa said today’s experience reminded her of when she was a child and her brother and sister would join her at the dining room table, drawing or coloring. I often joined in as well. It was a calming activity that forged bonds between us and allowed creativity to develop. Those are precious memories. I have a huge box upstairs, full of my children’s drawings and art work. It’s time to bring that box out and look through it again. 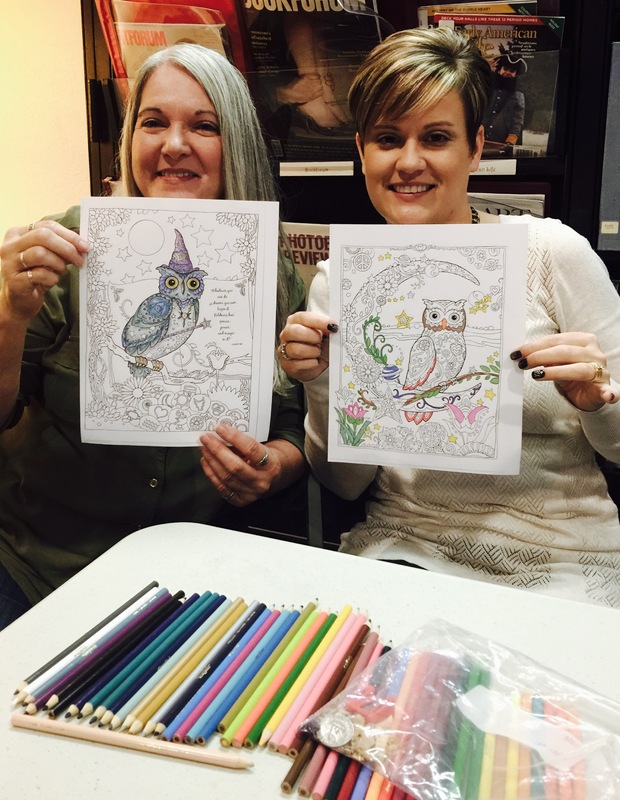 Coloring together is still a companionable and creative way to spend time together. An hour and a half was not enough time to complete a picture, at least not the way we all color, but it was a great start. And it was fun! 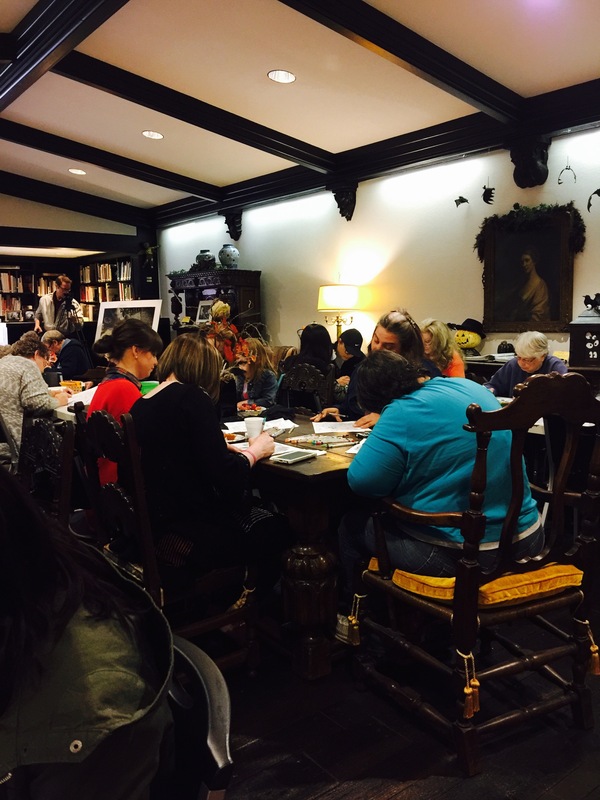 Laughter and conversations flowed around the packed out room and that was magical, being in the presence of so much creativity and joy. 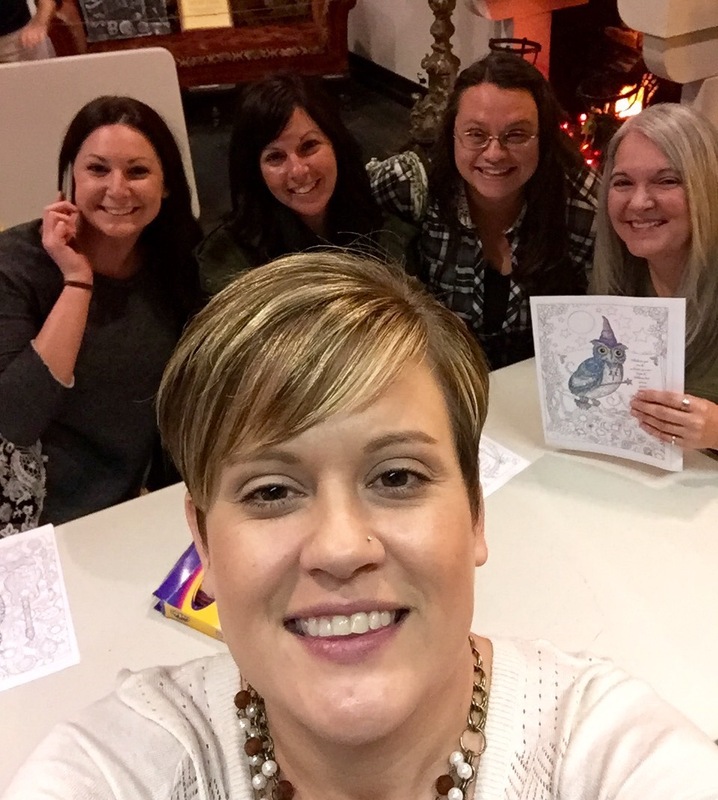 The next meeting of the Coloring Book Club is in December, and every other month thereafter. Spiva Center for the Arts will be the next host. If you are in the Joplin area, like Coloring Book Club on Facebook for updates about the dates and times. 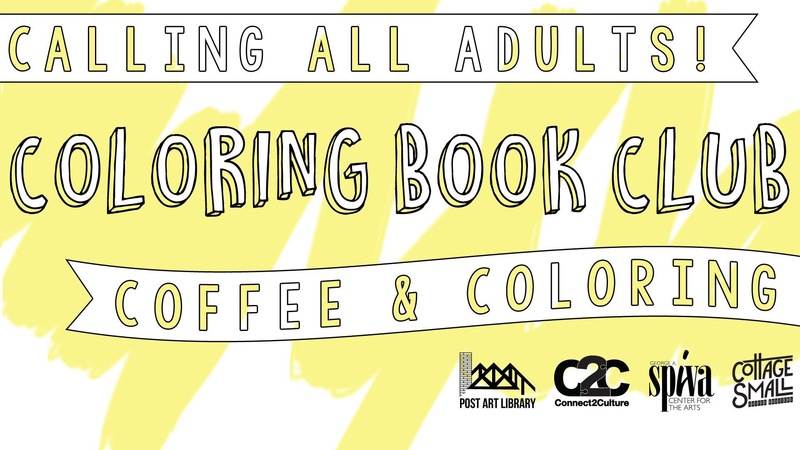 And join us…for fun, coloring, companionship and coffee. I’ll be there!